Blur Busters Forums • View topic - Any way to reduce inversion artifacts? Any way to reduce inversion artifacts? Recently I picked up a Dell 2716DG 27" 144 hz monitor and overall I'm pretty happy with it. The black levels and colors are great and at 120 hz and above everything runs smooth as buttered silk. But once I started to play games on it, I started to notice a lot of issues with a very fine grid-like pattern showing up on parts of the screen whenever there is motion and then it disappearing as soon as the motions stops. By using this site I've come to find out that this pattern is called inversion artifacts and is a common issue on monitors that use TN panels. So the question is, is there anything that can be done to reduce this problem? I've tried every combination of hz settings, g-sync and ulmb with no real improvement. Maybe I just have sensitive eyes but I find myself constantly noticing it and it gets annoying really fast. The weird thing is that when I run the inversion artifacts on the ufotest site everything looks fine, it's only during games that I notice the issues. I'm hoping that there may be something in the my video card settings (Geforce 970) that could help. Re: Any way to reduce inversion artifacts? Inversion artifacts vary during variable refresh rate, and different motion speeds. Also, inversion artifacts become amplified at odd "Pixels Per Frame" steps, such as 600pps, 720pps, or 840pps depending on the refresh rate you are using, make sure "Pixels Per Frame" is an odd number. You'll begin seeing inversion artifacts in the ghosting trail and/or backgrounds. -- Motion running at low VRR refresh rates (e.g. 45 Hertz). And becomes maximally amplifies if both is happening at the same time. Currently, the best way is to keep your frame rates extremely high; it helps make them less visible. Also, sit about 6 inches further away from your monitor when playing games -- the higher the resolution, the less visible the inversion artifacts become. 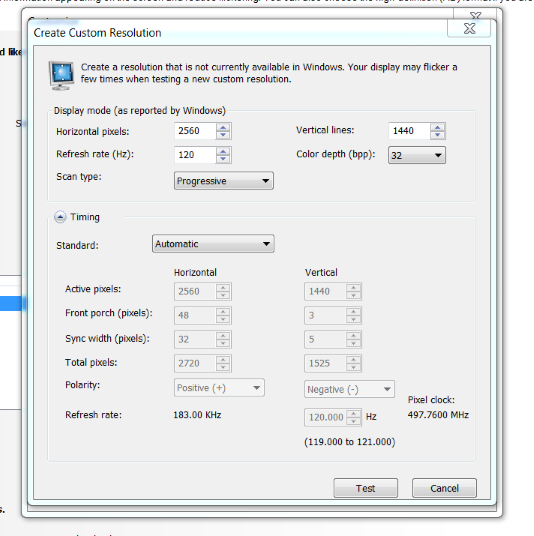 Chief Blur Buster wrote: depending on the refresh rate you are using, make sure "Pixels Per Frame" is an odd number. You'll begin seeing inversion artifacts in the ghosting trail and/or backgrounds. Thanks for the information. This gives me something to experiment with. Just wondering about the part above where you say to keep pixels per frame as odd. Is that a setting that can be changed somewhere? Checking around the only thing I found like that option to create a custom resolution. Is there anything in this section worth messing around with? I think he means for the blur busters alien test. Divide the pixels per second by the refresh rate you are using and you will see how many pixels the alien will move each frame. Any inversion pattern that uses an every other pixel pattern horizontally will repeat the same pattern over the alien in each position so you should see it more easily like it is part of the alien. Alas, inversion artifacts (vertical line patterns, checkerboard patterns) are a normal part of most TN LCDs, and some VA. They are least visible on IPS. It isn't always tied to refresh rate - I have seen 144Hz displays with more inversion artifacts than 240Hz displays, and vice versa - and inversion gets amplified by VRR and/or ULMB. There is no way to guarantee a videogame does motion to intentionally hide inversion artifacts. If you really, really dislike inversion artifacts, try one of those 1440p IPS G-SYNC displays in the G-SYNC list. That's another annoying thing I've noticed. This $800 Dell 2716DG 144 hz monitor has next to nothing for settings in the built in options menu. Basically just input source, brightness & contrast, some RGB color values and the option to turn ULMB on or off. There nothing for sharpness, gamma or screen positioning. By comparison, my second display is a basic Dell 24" that I got on sale for $100 and it has a ton more options to mess with, even pixel timing and pixel phasing options.